113 Ranked in Draft Mid-Terms - College Hockey, Inc.
33 schools have players or recruits listed by NHL Central Scouting. Denver commit Bobby Brink stands 29th among North American Skaters in the midterm rankings (Photo by Hickling Images). More than half of all Division I programs are represented in NHL Central Scouting’s midterm rankings for the 2019 NHL Draft, released Monday. A total of 113 NCAA players and recruits are featured in the rankings, representing 33 schools. This marks the fourth straight year that the number of NCAA players/recruits on the midterm rankings have increased and the 113 players listed are a 28% increase from 2016 (88). Recruits Alex Turcotte (Wisconsin), Matthew Boldy (Boston College) and Trevor Zegras (Boston University) lead the way at fifth, sixth and seventh in the rankings of North American skaters, while Boston College recruit Spencer Knight is the top-ranked North American goaltender. All four of those players are with USA Hockey’s National Team Development Program. Boston University and Minnesota lead all schools with eight representatives each in the rankings. 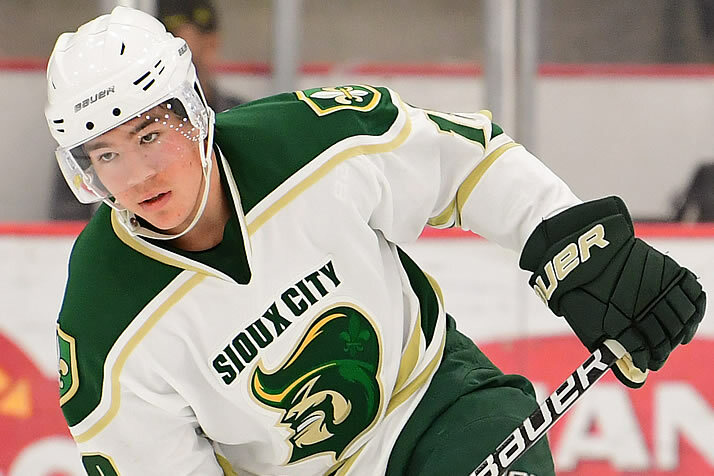 North Dakota and Providence each boast seven ranked players/recruits. Fifty-two of the NCAA recruited featured in the rankings are currently playing in the USHL, including 19 who are with USA Hockey’s National Team Development Program. Twenty-six players are playing in one of the leagues that make up the CJHL. The 2019 NHL Draft will be held in Vancouver, June 21-22. The 2018 NHL Draft saw 67 NCAA players and recruits selected, the most since 2007.